We evaluated urinary continence in a series of consecutive patients who underwent Retzius-sparing robot-assisted radical prostatectomy (RS-RARP) to identify the preoperative predictors of the return to immediate urinary continence. 110 consecutive patients who underwent RS-RARP for clinically localized prostate cancer were retrospectively collected. 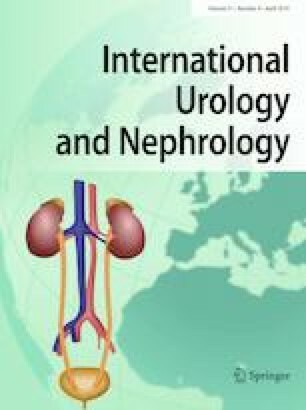 Patients reported freedom from using safety pad (0 pad/day) within 7 days after removal of urinary catheter were defined as immediate urinary continent. A total of 85 patients (77.27%) were immediate urinary continent after RS-RARP. Patients with immediate urinary continence were significantly younger (66.92 ± 5.73 vs. 69.68 ± 4.99 years, p = 0.031) than those who were incontinent. Furthermore, the prostate volume was significantly smaller (30.90 vs. 44.60 ml, p = 0.001) and preoperative international prostate symptom score (IPSS) was significantly lower (Mild 76.5% vs. 24.0%, Moderate 20.0% vs. 32.0%, and Severe 3.5% vs. 44.0%, p = 0.000) in patients with immediate urinary continence compared with those who were not. On univariable regression analysis, patient’s age (OR 0.907, p = 0.035), prostate volume (OR 0.935, p = 0.000), moderate (OR 0.196, p = 0.007), and severe IPSS (OR 0.025, p = 0.000) (compared with mild IPSS) were independent adverse predictors of immediate urinary continence. On multivariable analysis, prostate volume (OR 0.955, p = 0.032) and severe preoperative IPSS (OR 0.044, p = 0.000) (compared with mild IPSS) were independent adverse predictors of immediate urinary continence after RS-RARP. RS-RARP hastens the recovery of urinary continence after surgery. Prostate volume and severe preoperative IPSS were independent adverse predictors of the return to immediate urinary continence. Haixiang Qin, Xuefeng Qiu, and Haoxing Ma have contributed equally to this work. This study was supported by grants from the National Natural Science Foundation of China (81772710, 81602232, 81572519), Natural Science Foundation of Jiangsu Province (BK20150112, BK20150097), Nanjing Medical Science and technique Development Foundation (QRX17128), and Nanjing Health Distinguished Youth Fund (JQX16025). All procedures performed in studies were approved by the Ethics Committee of the Drum Tower Hospital, Medical School of Nanjing University, with a waiver of written informed consent given the retrospective nature of this study.